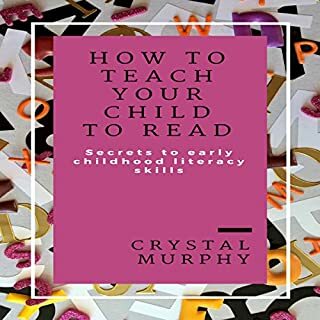 This book contains information for parents to teach early literacy skills such as: alphabet identification, phonics, vowel sounds, consonant blends, and three-letter word reading. The book provides details regarding the appropriate tools and methods used by professional educators to have children reading at an accelerated pace. This is a quick and rather cheap book that contains some pretty decent basics on teaching your kid to read as a parent. It does not mention any research so I can't be sure the author's suggestions are any better then anyone else's but they mostly seem pretty reasonable. They range from obvious (read to your child starting from infancy) to specific (create a book/reading area in child's room, brands/publishers of certain early reading books and prices). Some of it is common sense but she does include some examples of how to discuss things that might be helpful to some parents (ex: talking about big and little things like Mommy vs kid's feet before introducing lower case letters). Unfortunately, I think the main usefulness of this book is ruined or at the very least incredibly inconvenient in audio book form. First, she includes lists of specific products she suggests (this brand of phonics flashcards or this brand has three word letter puzzle that also make sentences that rhyme?). I listened to this book less then two hours ago and already I don't know what the brands where since I listen to audio books when I an working out or getting things done and not sitting there taking notes. Also, a good chunk of this book is I think a rather useful review of phonics. This is mostly in the form of tables and lists which the narrator just reads aloud. It's unhelpful enough for her to go through pre-K and several grades of sight words just reading them off but they don't even adjust the wording for it being aloud. So at the beginning of the phonics sections it goes over the proper sounds of each letter and then a huge list of blends. (Again, this would have been quite useful in written form/a table.) She specifically mentions it's important parents get these sounds right and it's been awhile. But instead of saying "J makes [actual sound] sound like in jaguar" as you would speaking aloud it's clearly just being read from a book never meant to be audio. So it's "J (says the letter) makes the sound like in Jaguar". And completely misses the only advantage of it being aloud and actually making the sound separate you'd have to teach the kid. Sure, this doesn't matter for J but for some of the more obscure blends it could have been actually sort of helpful. Much, much less helpful then an actual list of course. I'm not saying this is a bad book, just it seems you would get the most benefit from purchasing (or checking out form the library) a physical or written form digital copy rather then this audio version.